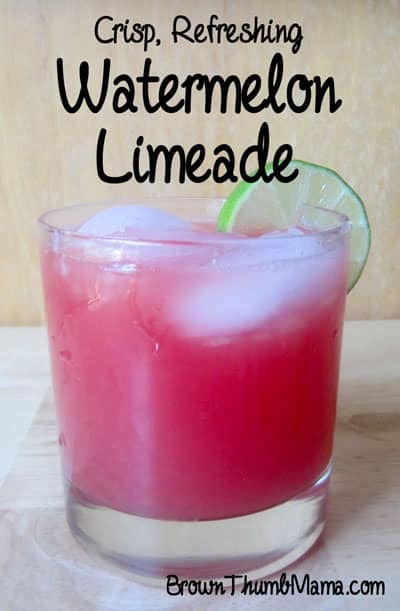 This delicious watermelon limeade is perfect for a picnic–cool, refreshing, and not too sweet. This is the perfect drink for a picnic! It’s cool, refreshing, and not too sweet. Glass serving pitcher: this one is made with beautiful rippled glass. Working a little at a time, puree the watermelon in a blender until smooth. Strain it through a mesh strainer so you don’t end up chewing your drink. You need 4 cups of watermelon juice after it’s all been blended and strained (if you have a little more, that’s fine). Put the juice into a glass or plastic pitcher. Add the lime juice and sugar, and stir gently until the sugar dissolves. Serve chilled, over ice. If you’re feeling saucy, add a bit of tequila (or coconut rum) to your glass. Mmm-mmm! Great summer drink made with fresh ingredients. Such a beautiful color. Very appealing!